Get competitive quotes on outdoor advertising in Glendale! 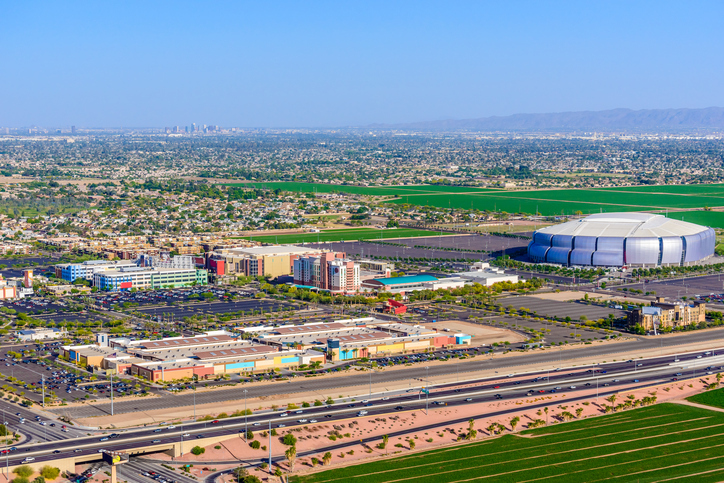 Glendale, Arizona is a great city for outdoor advertising thanks to its vicinity to downtown Phoenix, just 9 miles away, and boasts a population of nearly 250,000 itself. The sporty city hosts the Arizona Cardinals NFL team at its University of Phoenix Stadium and the Arizona Coyotes NHL team at the Gila River Arena. Catch the eye of these fans with on-street advertising such as billboards, street furniture advertising, and transit advertising. Glendale proves it’s more than a sports town with its diverse mix of shopping and entertainment options in the Westgate Entertainment district, making this city a top location for mall advertising. Find ad space near these popular spots or find potential customers by advertising along Piestewa Freeway or U.S Route 60. Select an ad type below to learn more. Or, browse BillboardsIn’s extensive database to find competitive quotes on your next campaign in Glendale, Arizona.